Corolla on the Currituck Outer Banks is vacationland. This area is, on the whole, the newest, most modern resort area on the Outer Banks, and it exists primarily for summer vacations. 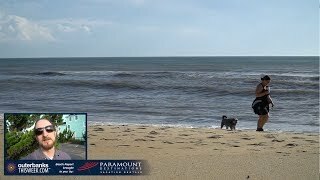 Corolla has many miles of beautiful beaches and thousands upon thousands of rental cottages to house the people who want to enjoy the sand and the sea. The area accommodates visitors with the best of all amenities and plenty of fun things to do. The Currituck Outer Banks is on the northernmost end of the Outer Banks, making up the first 20 miles of the 50-mile-long peninsula that also houses Duck, Kitty Hawk and Nags Head. Though it borders the state of Virginia, the Currituck Outer Banks is not accessible from the Virginia border. To get to Corolla you must drive north on two-lane N.C. Highway 12 from Dare County, passing through Southern Shores, Duck and the Sanderling community before crossing the line into Currituck County. Currituck Outer Banks is made up of two distinct areas – the southern portion, often referred to entirely as Corolla, and the northern portion, usually called the Four-Wheel-Drive Area. It is common nowadays for people to refer to the whole southern portion of the Currituck Outer Banks as “Corolla,” though historically that name was only used for the very small village near the lighthouse. Corolla is not a town (there are no incorporated towns in the whole of Currituck County) but it’s the name of the only post office on the Currituck Outer Banks, so it works well as the moniker for the whole area. Until the development boom of the 1980s, only 30 years ago, Corolla was little-known and little-traveled and was often referred to as North Carolina’s last beach frontier. That’s all changed today. Corolla has grown quite rapidly, and it is a top vacation destination on the East Coast. The establishment of rental properties and a few hotels has brought vacationers, which has in turn brought all the amenities of a modern vacation — shopping centers, restaurants, movies, grocery stores, a golf course, tennis, swimming pools galore, attractions, recreational opportunities and, as always, the beach. Corolla’s location is a little out of the way, but it’s not really remote. The only issue with traveling to Corolla is that it’s essentially at a dead end; there’s only one way in and out, and that’s on a two-lane highway. With as many as 50,000 people vacationing here per week in the height of the summer season, you can imagine that traffic is awfully sluggish on summer weekends at rental changeover time. It can take a couple of hours to travel only 10 miles or so along the northern Outer Banks on Saturday and Sunday afternoons in July and August. People are making efforts to solve this problem. Regularly scheduled air service is available to Corolla, some rental companies offer alternative check-in days and times, and many locals are pushing to establish a bridge across the Currituck Sound. The bridge would eliminate the need to travel through the congested areas of Southern Shores and Duck to get to Corolla, as it would connect to the Currituck mainland. Should this bridge ever come to fruition, and surely it will someday, it will shave at least an hour off the trip to Corolla. The Corolla area consists mostly of planned development communities or subdivisions — Pine Island, Palmer’s Island, The Currituck Club, Ocean Sands, Whalehead, Buck Island, Monterey Shores, Corolla Light, Village at Ocean Hill and others. These subdivisions are vacation oriented. The larger ones offer amenities like pools, tennis courts, bike paths, beach accesses, shuttles and other recreational opportunities for their guests. Corolla’s housing and shopping areas are spread out over about 20 miles, and there is no exact center. For this reason, if you want to do anything besides go to the beach, you’ll need a car while vacationing in Corolla. The southern end of the Currituck Outer Banks, near the Dare County line, is almost entirely residential. The oceanfront is lined with enormous homes, some of them for rent, some not. As you head a little farther north, you come to the Currituck Club, a golf course community with many smaller subdivisions of homes. A Harris Teeter grocery store and only a few shops and restaurants serve the lower area. Farther to the north is where the real shopping and dining and recreation are located. Timbuk II is a shopping and entertainment village with tons of shops, restaurants and recreational activities. Across the street is Monterey Plaza with more restaurants, shops and a Food Lion grocery store. Be sure to pick up a copy of Eat, Shop, Play magazine when you're on the Outer Banks to read details on shops, restaurants, attractions, accommodations and recreation in Corolla. Drive all the way up N.C. Highway 12 through Corolla, and you’ll eventually find a surprise: The paved road ends and in front of you is a stretch of beach and sand. Unless you have a four-wheel-drive vehicle, you have to turn around. Those with four-wheel-drive can keep going, up the beach for another 13 miles, until you are stopped by a gate at the Virginia line. Locals call this the Four-Wheel-Drive Area, for lack of a better name. You’ll also hear parts of this area referred to as Carova, Swan Beach or North Swan Beach. The Four-Wheel-Drive Area is remote, often referred to as “back country.” It is home to a national wildlife refuge and a wild-horse sanctuary. It is also home to an increasingly large number of private and rental homes, so if you love the rugged side of the Outer Banks, it is available to you. If you don’t have a four-wheel-drive vehicle, several companies offer guided tours of this area, and they point out the wildlife, wild horses, history and natural features along the way. There is something for everyone to do in Corolla. Most visitors are attracted to the wide, clean, easily accessible beaches, but Corolla is also home to some of the Outer Banks’ top attractions. The attractions are clustered together, so visiting all three makes for a great day off from the beach. Whalehead is an historic house museum. Originally known as Corolla Island, it was a vacation home for a wealthy northern couple who had great taste in Art Nouveau design. The Outer Banks Center for Wildlife Education is an educational center offering exhibits and programs about the natural and cultural history of the Currituck Outer Banks. 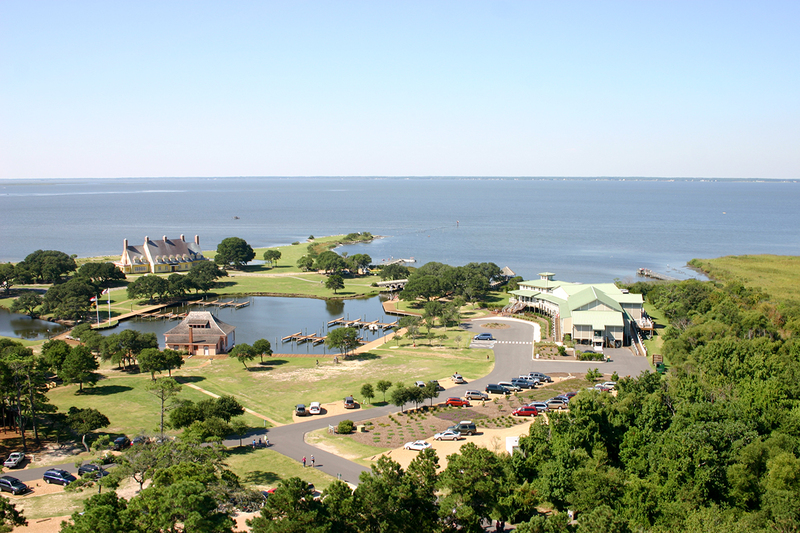 The Currituck Beach Lighthouse is open for climbing and offers an amazing view from the top. Other favorite things to do in Corolla include shopping, water sports, tennis at the Pine Island Racquet Club, golf at The Currituck Club and horse tours (see the section on horses, below). Corolla is the perfect location for a daytrip, but we recommend going during the week in the summer months. Traffic is too bad on the weekends. In the summer, it takes about an hour, or maybe a little less, to reach the northern end of Corolla from the Nags Head-Kill Devil Hills area. It’s about 20 minutes from Duck. You can hit all three attractions – the Currituck Beach Lighthouse, The Whalehead Club and the Outer Banks Center for Wildlife Education – in about two and a half hours. After lunch, you’ll still have time for a wild horse tour. 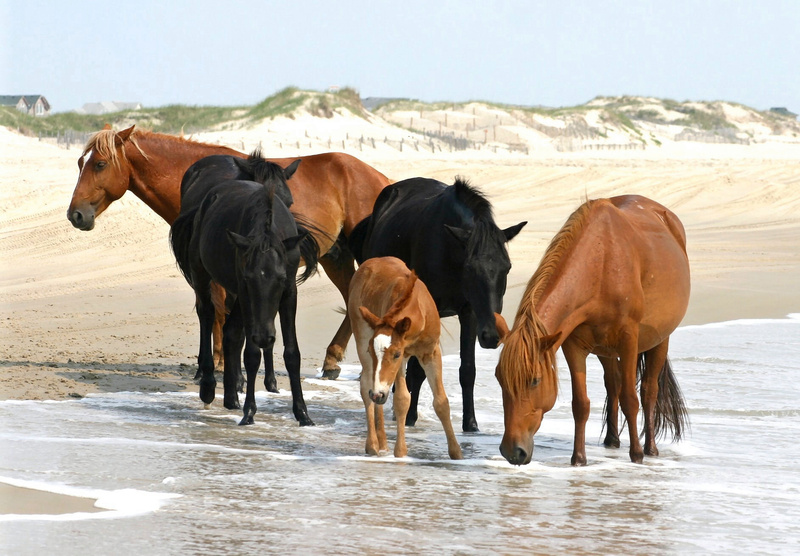 North of Corolla, about 70 or so wild horses live in the natural habitat of the Outer Banks. The bay, chestnut, sorrel and black wild horses are a beautiful sight feasting on salt hay and coarse grasses and drinking rainwater that collects in swales. How did these horses get to the Outer Banks? It is widely believed that the Corolla wild horses, like those on Ocracoke Island and Shackleford Banks farther south, have been living on the northern Outer Banks for more than 400 years, since the era of early Spanish and English exploration of the New World. It is unknown exactly how the horses arrived on this coast, but most believe it was by way of Spanish or English explorers, or both. Spanish conquistadors explored coastal North Carolina in the early 1500s, bringing with them horses, sheep, cows and pigs that were bred in the Spanish colony of Puerto Rico, but they abandoned their livestock when they ran into conflict with the Native Americans. Later, English explorers brought Spanish-bred horses and livestock on their voyages to Roanoke Island between 1584 and 1590. Some say the horses could have also swum ashore from shipwrecks. Scientific and genetic studies have proven that the horses have genetic connections to Spanish mustangs. In fact, they are some of the purest descendants of the Spanish mustangs because of their isolation on the remote Outer Banks. You can watch these wild horses if you travel up to the Four-Wheel-Drive Area. Oftentimes you can spot them if you drive around on your own, but the best way to see them is to take a wild horse tour. The tour companies know exactly where to find the horses and can give you lots of information about them as well as point out interesting sites along the way. You can take tours in four-wheel-drive Suburbans, on kayaks, on electric ATVs or — get this — on four-wheel-drive, electric Segways. One note, however: It is the law that you do not approach or feed these horses, and enforcement is strict for the safety of these magnificent animals. It's for your protection too...they are wild, not domesticated. Across the Currituck Sound from the Outer Banks is the Currituck mainland. If you’re driving in from the north heading to the Currituck Outer Banks, you’ll pass through the Currituck mainland before crossing over into Dare County and then heading back into Currituck County on the Outer Banks. Most people zip through the Currituck mainland on their way to and from the beach, but if you take your time when traveling through this area, you won’t be disappointed. This is beautiful country. The heritage of the Currituck mainland is agricultural, and much of the area continues to be cultivated for corn, soybeans, wheat, cotton, vegetables, peaches and grapes. (There are several wineries in Currituck County!) As you pass through the area on U.S. Highway 158, you’ll find numerous roadside stands offering a variety of fresh, local produce. Do not pass through here without stopping at a stand to stock up on sweet corn, tomatoes, strawberries, melons, squash and all the other produce that’s in-season when you’re visiting. If you want to taste the local wine, you can take the ferry to Knotts Island or stop at Sanctuary Vineyards in Jarvisburg. Also along the highway, you’ll find antiques shops and down-home restaurants, including some of the best eastern North Carolina barbecue around. Monster-truck fans may be surprised to see the home of the Grave Digger right alongside U.S. Highway 158 (there’s a little museum and shop, so make a stop if you’re interested in this hometown hero). Mainland Currituck County is changing from its small-town feel and agricultural roots, however. 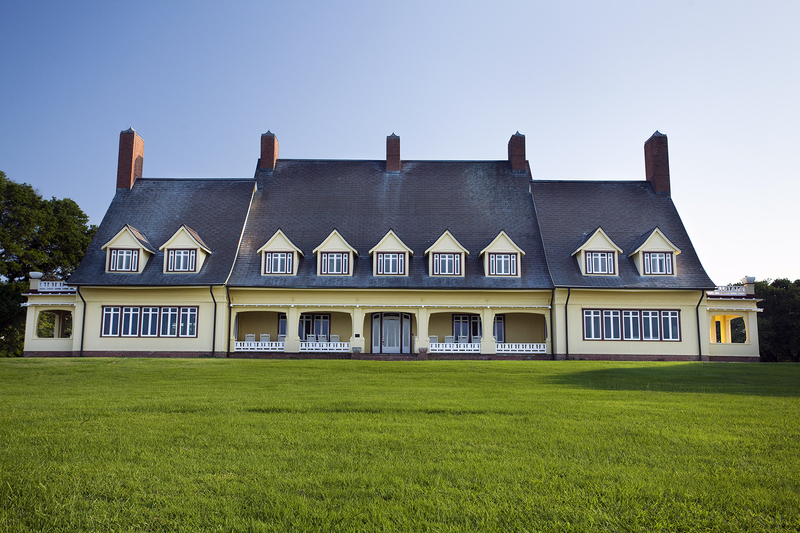 Sandwiched between the Outer Banks and the metropolitan area of Hampton Roads, Virginia, Currituck is catching spillover growth and development from those two areas and is now one of the fastest-growing counties in North Carolina. Signs of change are everywhere, but the county is doing its best to balance rapid growth with the area’s culture and heritage. “Currituck” is an Algonquin Indian word that means “Land of the Wild Goose,” and the county hopes to keep its waters, marshes, woods and wildlife intact. An interesting geographical feature of Currituck County is that the Intracoastal Waterway runs through the county and separates the southern mainland from the northern mainland. Marinas and restaurants serve the pleasure and commercial vessels that travel up and down the waterway. Yet another area of Currituck is Knotts Island. To get there you have to take a short ferry ride across the Currituck Sound. You can also drive there from Virginia but we recommend the ferry ride from Currituck. Knotts Island is worth a visit because it is home to a winery that is open to the public for tours and tastings: Martin Vineyards also has an orchard where you can pick apples or peaches in season. Also of interest on Knotts Island is the Mackay Island National Wildlife Refuge, which is open for wildlife viewing, birding, walking, biking, fishing and boating.